QuestionWhich animals are the moodiest? Animals have complex and nuanced inner lives. Think of the cat cowering under furniture when guests arrive, or the dog leaping for joy when she sees her master. Antidepressant and antianxiety medications are prescribed to pets and zoo animals regularly, and studies show that chimps who survive lab experiments commonly suffer from PTSD. While there’s no doubt that animals react emotionally to their situations and surroundings, which animals feel most profoundly? Hopes&Fears asked experts to follow the question of animal moodiness out to the wild and deep inside animal brains and bodies. “Man is the only animal that blushes, or needs to,” said Mark Twain. But he was only half right. Some animals change the colour of their skins in spectacular ways, including to deepest red. Chameleons — whose ability to colour shift is down to the repositioning of floating nano-crystals in its skin — are a notable example, but by no means the only one. It seems beyond belief, however, that chameleons turn red out of embarrassment — or any emotion in a way we can readily understand. Attributing moods to animals makes most sense when we are talking about mammals, with whom we share the ‘emotional brain,’ or limbic system. It is readily apparent when a dog, or even an elephant, is in a playful mood. The brains of birds are differently organised but it is now well recognised that some species (especially the crow family) can be at least as playful and affectionate, not to mention as smart, as almost any mammal. And beyond that? When it comes to other vertebrates (the reptiles, amphibians and fish) and members of other phyla such as arthropods we can say with confidence that they do experience pain and other sensations. But we’d be wise tread cautiously when talking about emotion, and even more so when talking about its subtle cousin, mood. Still, where would life be without some wild speculation? Could there be animals utterly alien from us who may yet experience moods? 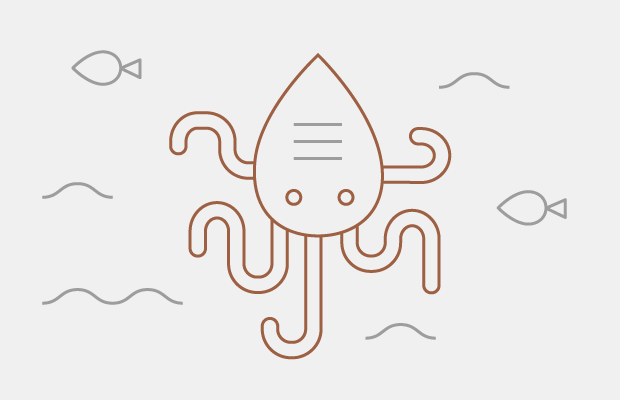 My prime candidate are the cephalopods — the octopuses, squid and cuttlefish. Don’t let the fact that these animals are basically souped-up slugs with whom we last shared an ancestor more than 500 million years ago fool you. Their ingenuity and intelligence is legendary. In some species of cuttlefish, sneaky males display a female pattern on one side of their body to another male, while simultaneously displaying male colouration on the other side to a female whom they are courting. Common octopuses have what psychologists call primary consciousness, and can solve problems that defeat young children and dogs. Some species can alter their skin colour and texture ‘at will’ to mimic sand, coral, rocks or passing shadows. Who knows what thoughts, and moods, may be passing through their exquisitely sensitive arms and complex brains? The term “moodiness” carries with it a certain negative connotation, I think; rapid shifts in gloomy, petulant fits when, really it’s just the changing of temperaments, good and bad. The idea of moodiness is a very human notion, and we need to be very careful when assigning human attributes to animals. While we cannot speak to an animal’s moodiness in the context of human emotions, as anthropomorphizing can be misleading, we can look to other relatable characteristics such as personality or self-awareness in terms of perceptions of animal temperament. There are 5 dimensions of personality in animal behavior: openness to new experiences, conscientiousness, extraversion, agreeableness and neuroticism. And while these characteristics can be difficult to assess in a non-self-reporting subject like an animal, being mindful of these attributes can certainly be a helpful predictor of how an animal might react to certain stimuli, which could be extrapolated as an animal’s “mood”. A more extraverted, intelligent and reactive animal is going to respond to more stimuli and appear moodier. And what is mood or temperament but reaction to certain stimuli, internal or external, hormones, hunger or a nearby foe? Looking at the neuroscience of mood, evolutionarily, we see similar brain structures and mechanisms intended to process emotions across mammalian brains, giving us a basic insight into the emotional lives of non-human animals. There are different degrees of emotional processing from more instinctual and primal networks, to higher-order thoughts and cognitive abilities. At a primary level, the same seven core systems are seen in all mammal brains: seeking behavior, rage, fear, lust, (maternal) care, fear or grief (in separation/isolation), and physical play. These behavioral systems are manifested in humans and animals alike. Is the winter and seasonal depression catching up with you? Well, the wood frog hibernates 7 months to a year! Feeling defensive or nurturing? Protective gorillas possess a powerful maternal instinct and ability for infant care. Looking for love? As adorable as sea otters are, their competition for mates is fierce. Experiencing grief over a loved one? Elephants mourn over the bodies of their dead. Need to blow off some steam? Just follow the dolphins’ lead! They blow air rings and toss seaweed around for the sheer fun of it, a clear example of play in the animal kingdom. There is evidence of intelligence, self-awareness and empathy in certain animals but the communication barrier widens the divide of understanding and adds to the mystery of moods. I think it’s extremely important to remember that to only apply our limited scope of understanding to the animal world is to limit our ability to learn from and about them. So who are the moodiest animals? I wouldn’t count us humans out; I am definitely in the running for that title.